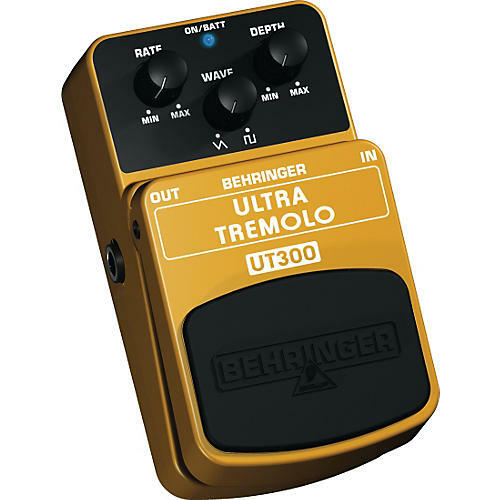 When you've got to have the classic tremolo made famous by vintage '50s amps, get the Ultra Tremolo UT300. The classic surf music of the ˜50s and ˜60s might not have even happened if tremolo hadn't come along. Vintage amps produced this intriguing effect by pulsing the volume of the instrument signal at a user-adjustable rate. The UT300 pays homage to this legendary sound, bringing it up to date for modern surf freaks. With its dedicated Rate, Wave and Depth dials, you can shape a pulsating tremolo that nails every sound from rowdy rockabilly and surging surf, to modern space-rock. A red LED tells you when the effect is activated, and you can power this groovy stomp box with either a PSU-SB DC power supply (not included) or a 9 V battery. A top-quality On/Off switch maintains excellent signal integrity in bypass mode. Ride the wave of classic tremolo aboard the ULTRA TREMOLO UT300. And the best part-you'll still have money for board wax and gas to get you to the beach! Get yours today. Order now!